TRADE BETWEEN SABA AND SINT EUSTATIUS FOR THE YEAR 1744. 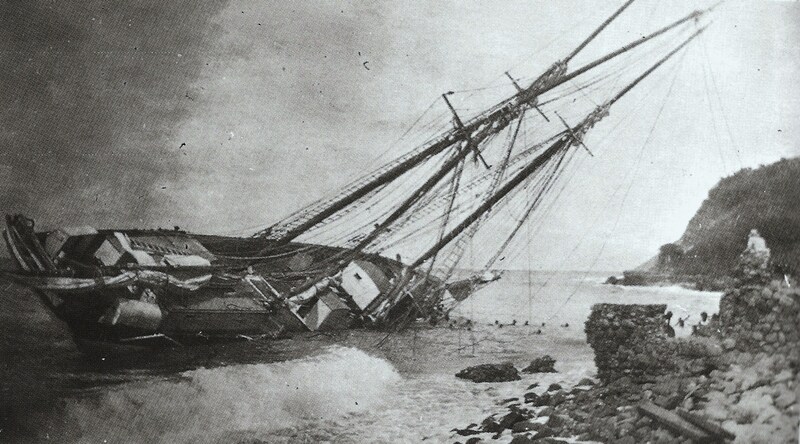 Sabans owned many schooners up until the middle of the last century. This is the “Mona Marie” of Captain Ben Hassell which was torpedoed by the Germans in World War II off St. Vincent. 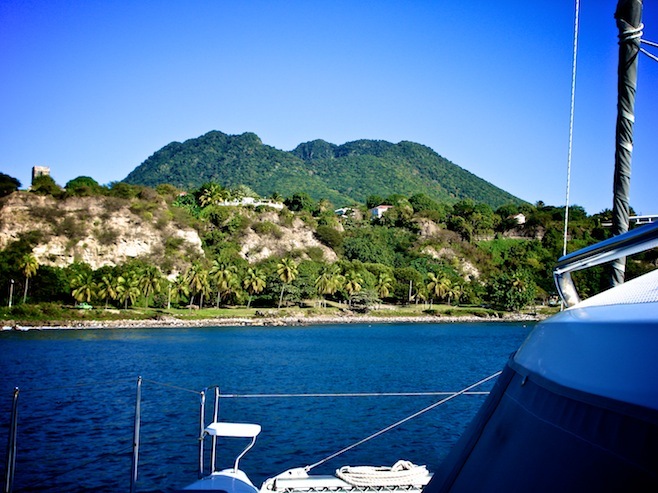 It is interesting to note that the trade between Saba and St. Eustatius was carried on mostly by Saba Captains whose fathers and grandfathers had been English and Scottish pirates. Most of the names from the year 1744 still exist on Saba even today. Among the captains I have several ancestors Jacob Valaan , a Courlander and the name was later to become Vlaun, Vlaughn etc. I have an original document from 1780 when he died his possessions were sold on auction as he had children by two separate wives and that was the way it was done back then, with the heirs having the privilege to bid on his possessions first.Also on this list Charles Simmons and Daniel Every are among my ancestors. I recently was sent a letter by a friend of mine Rose Mary Allen of Curacao who had attended a Conference of Caribbean Historians in the Bahamas. She sent me a document presented by a Puerto Rican historian who had located in the archives of Seville a long document in Spanish on a group of maroons who had escaped from Saba in 1654. I will translate that and deal with it later on. 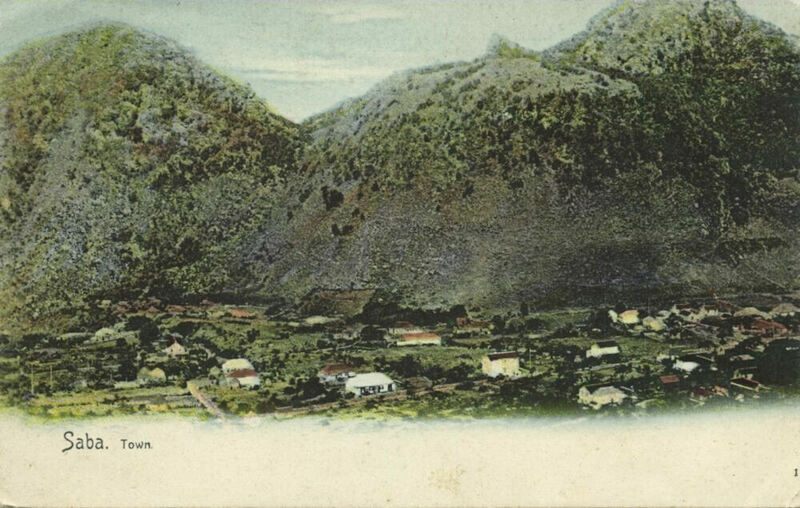 In that document it is stated that the majority of the population of Saba at that time were Englishmen, something never mentioned by Dutch historians.They always claim that Saba was settled by the Dutch from the island of St. Eustatius around 1640, but in my research many Irishmen, English and Scots came to Saba from St. Kitts in 1629 and established the villages of Palmetto Point and Middle Island. I am my own university and unlike academia who quote exclusively from other academia I have combined oral history with research in local archives as well as those of Curacao, Holland and England to come to various conclusions which I can defend when I make my dissertation to my own University which is me! 31.3. ” ” Jacob Simmons ” Recovery 10 passengers. 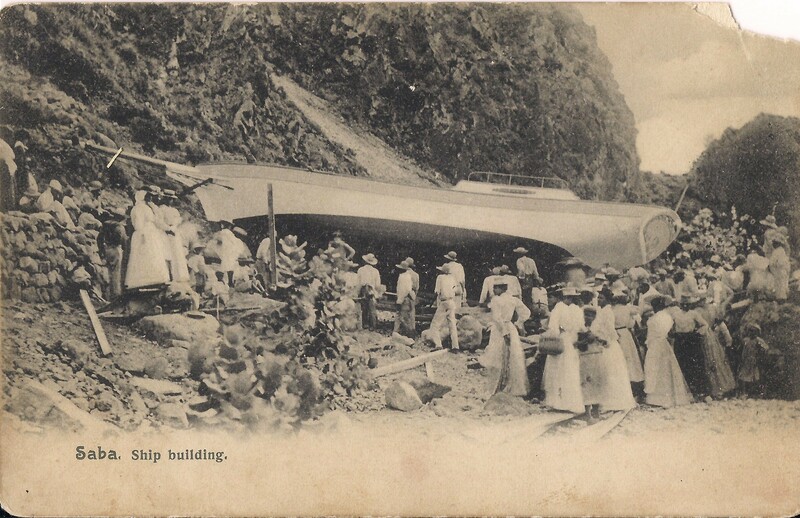 Schooner the “Mayflower” in the 1920’s in Statia’s Road stead. 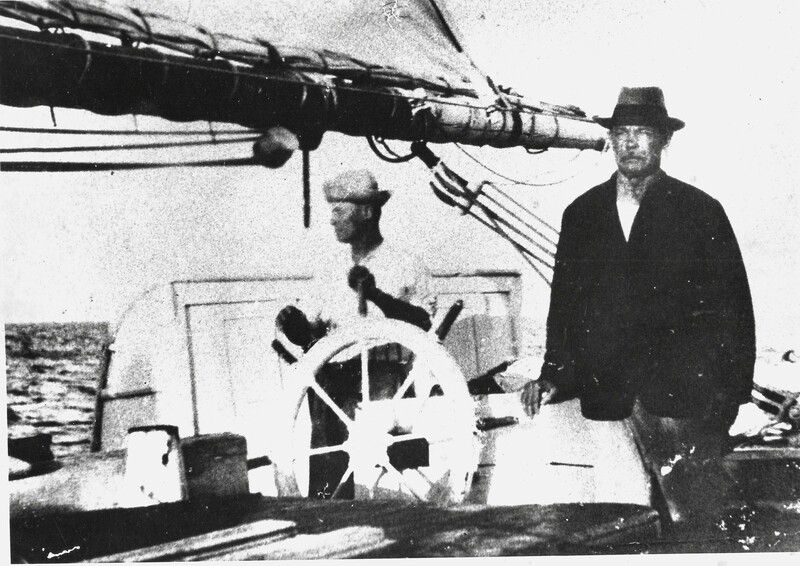 Captain Charles Reuben Simmons and owner was Thomas Charles Vanterpool of Saba. 7.6. 1744 Saba James Leverock Bark Hopewell 200lbs coffee 40? 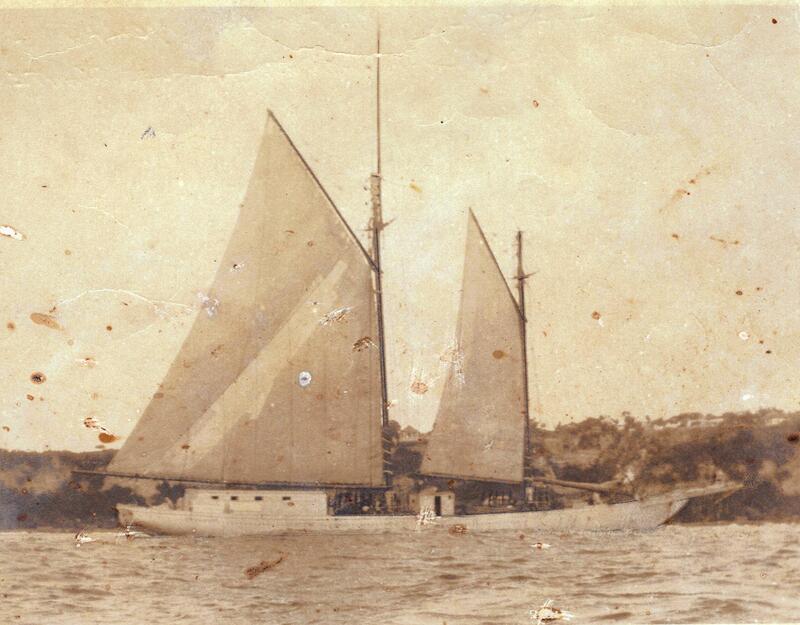 Schooner the “Ina Vanterpool” lost in the hurricane of 1928 on Statia. Was owned by Capt. Thomas Charles Vanterpool and named after his daughter. Capt. John Clarence at the wheel of the ‘Maisie Hassell’ and his brother standing Capt. William Benjamin Hassell. 1920’s. 8.11 ” ” Charles Simmons ” Speedwell 10 passengers 100lbs coffee. 28.12 ” ” Jacob Valaan ” Hopewell None. In the road stead of St. Eustatius in the nineteen seventies. I also have the list of vessels leaving the port of St. Eustatius in the year 1744 for Saba which I will add to this list when I get a chance. Ryan Espersen has been sharing parts of his research with me and I am thankful to him for that. I am recording certain things on my blog for future generations to know how our people survived on this small island in former times. It was either fish or cut bait. Each man and woman for themselves.No government employment to depend on then and it may happen again in the future. Here is the list of boats coming from St. Eustatius to Saba in the year 1744 with passengers and cargo. 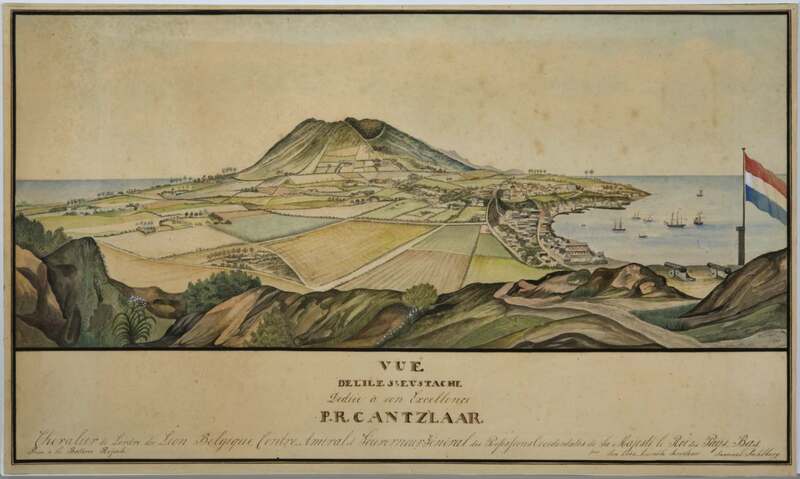 As St. Eustatius grew in economic importance in the next fifty years the trade between the two islands was much more than in 1744.Also I am of the belief that certain items were not listed as cargo, e.g. fish, ground vegetables, livestock and so on. What is listed as cargo in 1744 was probably” cargo” which was subject to some sort of tax and control of movement of people between the islands. This would answer the question as to why anyone would be sailing up and down between the two islands without any “cargo” or passengers. From other historical sources the trade between the two islands consisted mainly of food and livestock which most probably was not subject to any form of taxation and therefore not listed under “cargo”. 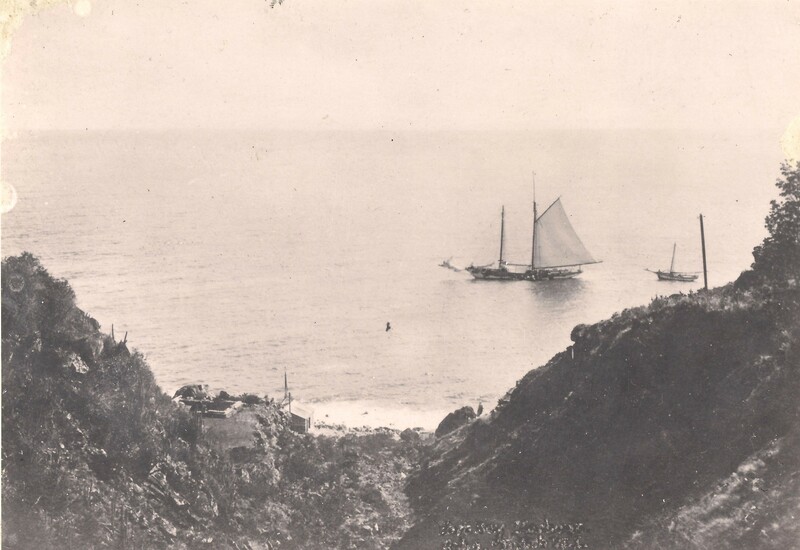 1920’s, schooner “Priscilla” and a sloop in the harbour of Saba in the 1920’s. 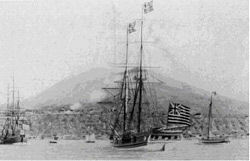 The schooner was one of a fleet of schooners owned by Captain Thomas Charles Vanterpool. Saba as seen from a boat approaching the island. That view remains the same as it would have been in 1744. The island of St, Eustatius as it would have looked like in 1744 when it was fast becoming a big trade center for the region and beyond. During the revolution by the British North American colonies much of the trade to those colonies was conducted via St. Eustatius and it is from that time that Saba captains became acquainted with builders of schooners and owners of large fleets of schooners of which many Sabans were captains. Sabans were captains from very young ages. Here sitting on the railing is Capt. 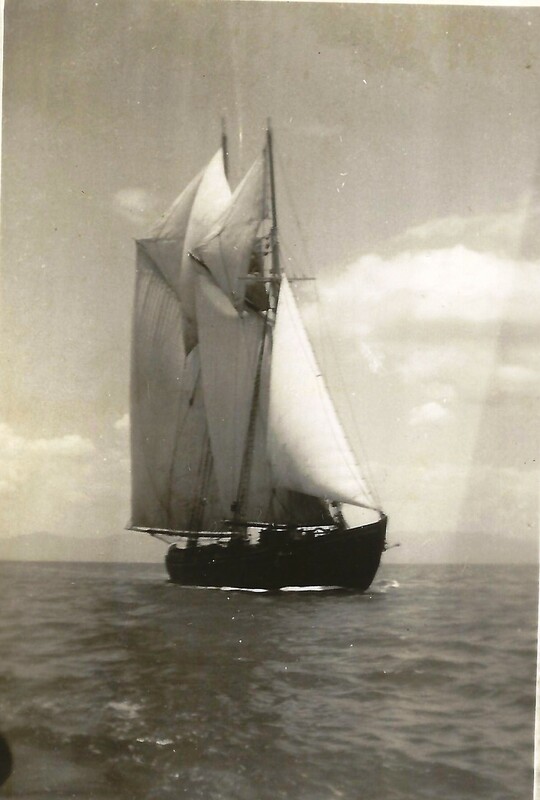 Laurie Hassell, then 19, and he was captain of his father’s (Captain Ben) schooner the “Mona Marie” sailing out of Barbados all the way to Guyana, Turks &Caicos islands, Jamaica, Saba and so on. Sabans built their own schooners and sloops from very early on and up until recent times when smaller fishing boats were built in the villages and carried down to the sea for launching and to fish the Saba Bank. Originally this family is supposedly descended from the Dutch Van der Poel listed here. 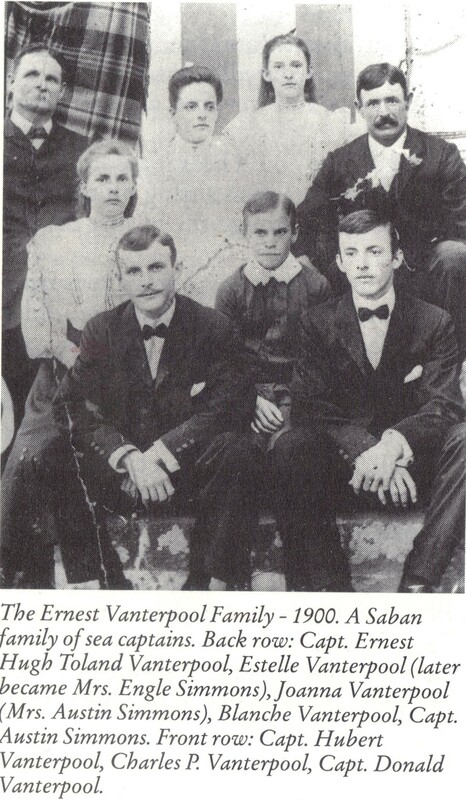 However the name was Anglicized from very early on to Vanetrpool, as when this family came to Saba in the early to mid eighteen hundreds from Virgin Gorda in the British Virgin Islands the name was already spelled as Vanterpool. As a family they owned the most large schooners which conducted trade with Curacao and New York. 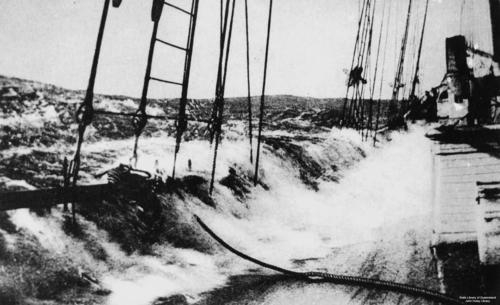 This was life at sea for most Sabans in former times. This is a large schooner the “Dorothy Palmer” at sea. Sabans like Capt. Lockland Heyliger were captains of the Palmer fleet. He was Captain of the large five masted Rebecca Palmer. 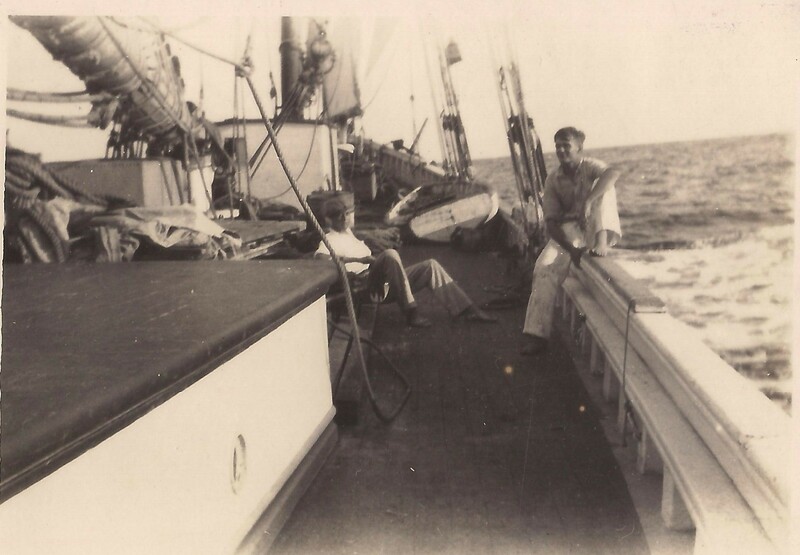 Life at sea was not easy but had its rewards as many of our captains lived well into their nineties before moving on to larger oceans to conquer. And so we present you with this tidbit of information for the trade between St. Eustatius and Saba for the year 1744.